KILLINGTON—Killington Elementary School (KES) recently welcomed its new kindergarten teacher, Ms. Jodi LeBrun, to the KES community. 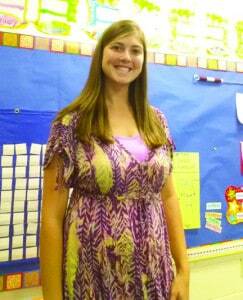 Ms. LeBrun has 10 years of experience in teaching kindergarten. She holds a B.S. in elementary education and an M.Ed. in early childhood education. She engages her kindergarten students in learning through songs, movement, and hands-on play. The KES Afterschool Program is now under the direction of Ms. Shayna Kalnitsky, KES grade 4 teacher, and Alex Reiss. Ms. Reiss has experience working with children in camps in both Pennsylvania and Lake Tahoe. She is energetic and has a passion for enriching student education. 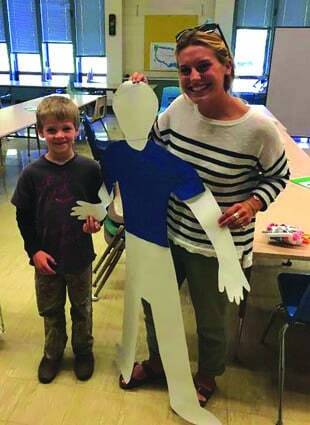 Ms. Shayna Kalnitsky stands with a student and his life-size tracing. New kindergarten teacher Jodi LeBrun.